Doc Griffin is now working with the new Sterling Single Length Irons by Tom Wishon! Come in today and discover the massive difference these clubs can make for your game. If you have some old clubs bring them to our shop and trade them in for a brand new set! Better Golf Is Just A Fit Away! If you’re looking for a high quality, knowledgeable, thorough, and professional golf club fitting service, you’ve come to the right place! At Doc Griffin Golf, we’ll give you exceptional service and unmatched personal attention and satisfaction. 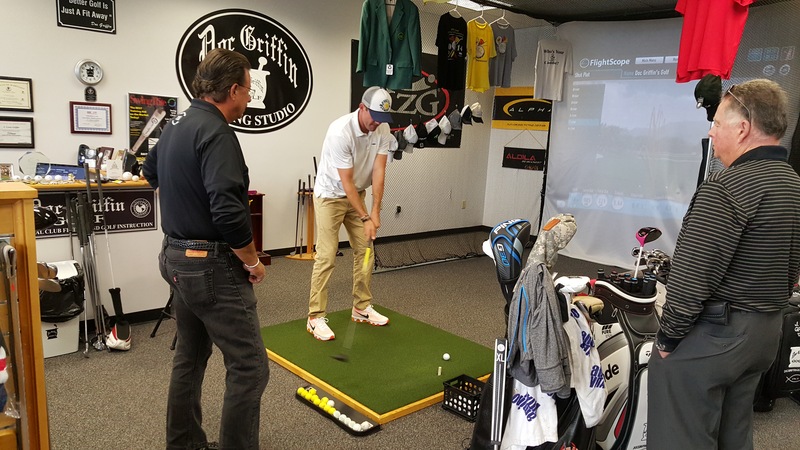 We have extensive experience with golfers of all skill levels from beginners to PGA Tour players and can provide you with the best custom golf club fitting experience. We use the latest in fitting methodology and tools and offer the best in equipment selections including brands such as Adams, Alpha, Bridgestone, Callaway, Cleveland, Cure Putters, Hopkins, KZG, Miura, Never Compromise, Odyssey, Ping, Srixon, Taylormade, Titleist, Tour Edge, Wilson, and Wilson. Good golf is impossible with ill fitted equipment. Let us put our experience to work for you. Better golf is just a fit away! We take our mantra that “Better Golf Is Just A Fit Away!” quite seriously and to further emphasize our desire to help you improve your golf, we are offering FREE UNLIMITED GOLF LESSONS with every fitting and club purchase! Hi Doc, I wanted to thank you for your help. I have played about 13 rounds since getting the clubs you made arrived in October. The driver is the straightest one I’ve ever had. My swing improves with each round and I am hitting very solid shots with a shorter swing. Lastly, although my swing is shorter, it is faster with less effort. I am glad I made the trip to see you in Michigan. Have a great Holiday Season. Fitting session with tour player DJ Trahan. I had a whole bag fitting session from you in June of last year and bought a whole set through you (Sterling irons with an Alpha 5W and Driver). Now that I have had plenty of run time with the clubs I just want to say THANK YOU! I was somewhat skeptical of hitting a driver with a lightweight regular flex shaft thinking it would just balloon but I kept reminding myself that you know a great deal more than me or the internet about what would work best for my swing. I must say, the results since switching to these clubs has been spectacular. I used to lose 4 to 5 balls each round just from errant tee shots. Now I hardly lose any! My scores have significantly improved, as has my confidence. I even broke 80 for the first time last fall which was a huge accomplishment for me. I am hoping to take advantage of those free lessons in June after my work slows down. I just wanted to take the opportunity to say thank you for being so excellent and passionate about your work. Watch Master Club Fitter Doc Griffin as he walks through the fitting process. Our facility is an individualized service operation. All fittings, lessons, repairs, etc. are done by appointment to ensure the best and most efficient use of our customers’ time. Fittings generally last 1/2 hour to 2 hours. Lessons take approximately 40 minutes. Repairs are usually completed within 24 hours and often can be done while you wait. Please call us at 803/798-1030 to discuss your particular needs and to schedule a convenient time to come in! Appointments are available Monday, Tuesday, and Thursday between the hours of 10AM and 6PM. We realize that our hours of operation may not fit everyone’s schedule. Please call us and we will work with you to find a time that is convenient. We are now able to offer long distance fitting to those not able to come to our Fitting Studio. To learn more please visit our Long Distance Fitting Page.